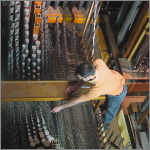 For over 50 years, it has been Andover’s duty and honor to care for the world-famous Great Organ in the Methuen Memorial Music Hall (MMMH.) 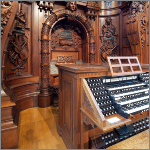 It was originally built in 1857-1863 by E. F. Walcker and Company of Ludwigsburg, Germany for the Boston Music Hall. 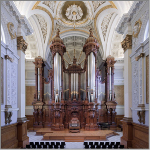 Unveiled to great acclaim in 1863, it was the first concert organ in the United States and exerted considerable influence on American organ design during the latter part of the19th century. 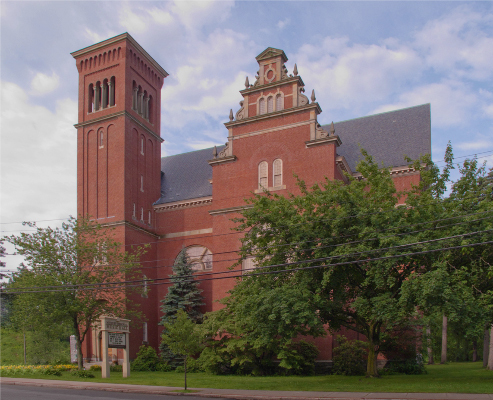 In 1897 Methuen millionaire Edward F. Searles purchased the instrument, completely rebuilt it and erected it in a specially built concert hall designed by noted English architect Henry Vaughan. 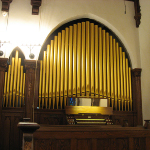 The instrument was premiered in its new home in December 1909. 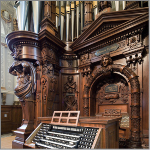 In 1947, G. Donald Harrison of the Aeolian-Skinner Organ Company completed an extensive tonal reconstruction of the organ. 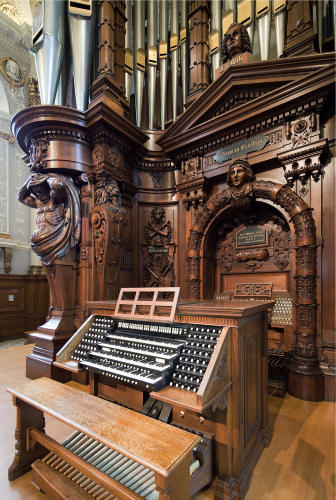 Although no significant changes were made to the organ’s mechanisms, the console was made moveable and provided with an electro-pneumatic combination action. 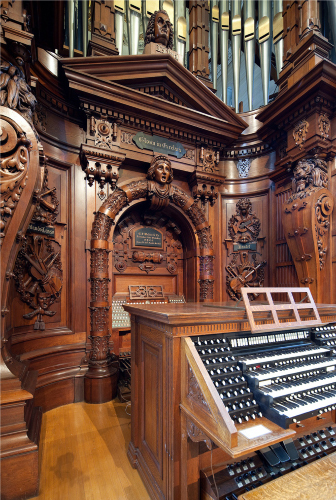 The Great Organ is featured each summer in a 15-week series of Wednesday evening recitals played by noted organists from around the world. In addition to special programs in the spring and fall, it is used many weekends for weddings held in the hall. 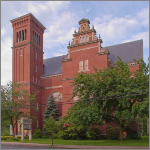 The MMMH website contains detailed information on all regularly scheduled recitals and concerts; a history, description and stop list of the organ; a history of the Music Hall; and mail order information about available compact discs, DVDs and books. 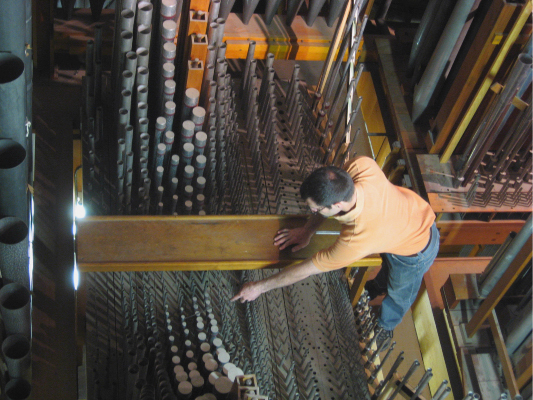 A concert organ of this size requires more than just a few hours of attention. Each spring we devote several days to “awaken the beast” and get it ready for the concert season, which starts in May. 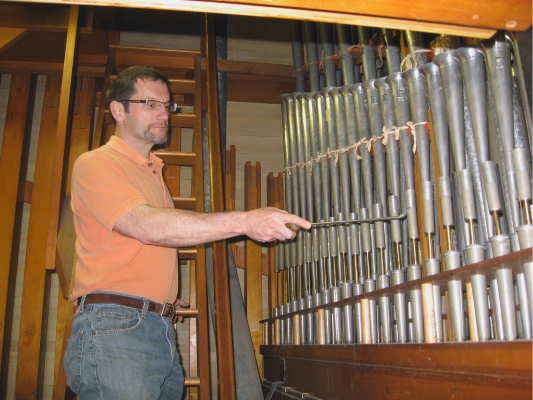 We check its mechanisms and, on a rotating basis, through-tune one entire division per year. We check and through-tune all the reeds, and any flue pipes as necessary. 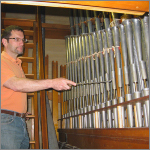 During the concert season we remain “on call” to do any touch-up tuning requested by a recitalist, or necessitated by a change in temperature. Many listeners are impressed by how well in tune the organ sounds, even in beastly heat (the hall does not have AC.) This is no accident; we have honed the tuning of the Great Organ to a fine science. Given the age of the instrument and the amount of use it receives, it is not surprising that its mechanisms need periodic restoration or renovation. The nature and scope of these projects are determined periodically by the MMMH Board of Trustees, with recommendations from us. 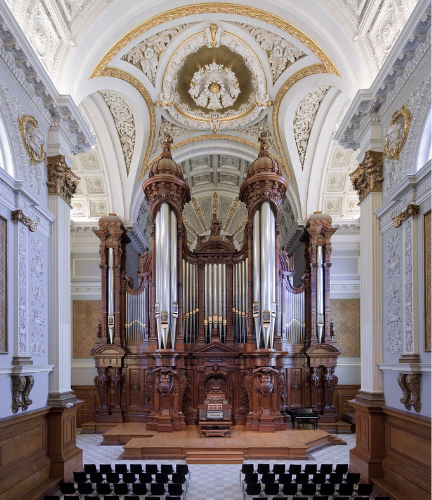 We work closely with the Board to implement its vision to maintain the Great Organ as both a historical musical landmark and an up-to-date recital instrument. These projects are normally done during the winter months, when the hall is closed. 1966  Replaced the existing blower with a new 3-stage, 2-pressure, 7 1⁄2 horsepower Spencer unit. 1970  Restored the tonal design of the Great division more along the lines of the Walcker original by the addition of a set of chorus reeds. 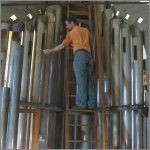 The Great reeds had been removed by G. Donald Harrison in Aeolian-Skinner's 1947 rebuild of the instrument. Utilizing windchest space and stopknobs already available, we installed a 16' Trumpet, an 8' Trumpet and a 4' Clarion. 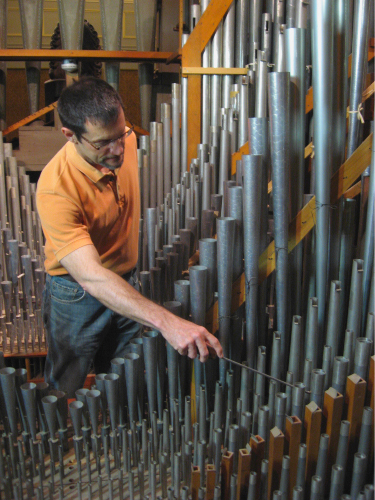 The pipes were made to our specifications by Roland Killinger of the Süd-Deutsche Orgelpfeifenfabrik of Freiberg-Beihingen, Germany. 1993  Replaced the 1947 single-level electro-pneumatic combination action with a 32-level solid-state system, made by Solid State Logic Ltd. of England. 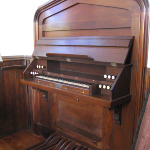 The old combination action machine was left in place in the base of the organ for historical purposes. 2000  Releathered all 86 stop action motors and fitted them with new silencing muffler covers. 2003  Recovered the manual keyboards with new non-endangered ivory naturals, refinished the sharps, installed new key bushings and electrical contacts, replaced the old pneumatic coupling action with solid-state switching, and replaced the 1947 cotton-covered wiring with modern cabling. 2005  Replaced the 1947 pneumatic drawknob motors with Harris electro-repulsion solenoids; replaced the pneumatic tilting tablet coupler assembly with a Harris electro-mechanical coupler assembly, increasing the number of couplers from 20 to 31; rebuilt the right stop jamb terraces from 5 knobs across to 6 to match the left jamb; installed additional oblique drawknobs and labels, and revised the stop layout. 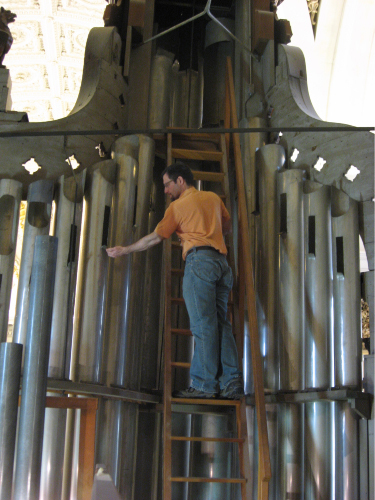 2006  Moved the Aeolian-Skinner 8' Krummhorn (61 note, spotted metal reed) rank from the enclosed Choir division to the unenclosed Positiv division utilizing a previously unused slider and toeboard of the Positiv windchest, and replaced it with an 8' Clarinet (61 note spotted metal reed rank of Aeolian-Skinner origin) on the Choir windchest. 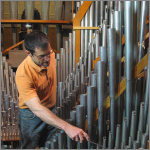 2007  Restored the tonal design of the Great division more along the lines of the Walcker original by the installation of a an 8' Gamba stop, utilizing pipes made in 1904 by the Hutchings-Votey Organ Company of Boston, Massachusetts. This stop replaced the seldom used 1 1/7' Septieme on the Great division. 2010  Restored the 16-stage "whiffletree" motor for the Swell expression shutters and added a pneumatic damper to prevent the shutters from slamming when closed quickly. 2011  Upgraded the combination action from 32 to 128 levels of memory. 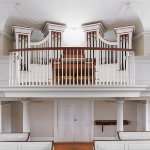 We invite you to come to Methuen to see and hear this magnificent landmark in America’s musical history. For further information, visit the MMMH website at: www.mmmh.org. Photos 1 - 4 by Len Levasseur, © 2011.